There are nine direct trains between Prague and Vienna. Two of them are overnight (sleeping) trains. The trains stop at Kolin – Pardubice – Ceska Trebova – Brno – Breclav – Hohenau. A one-way ticket without any discounts costs 1099 CZK (approximately 40 EUR) and if travelling by Pendolino train (SC) you also pay for the obligatory seat reservation, which is an extra 200 CZK (approximately 8 EUR). There are two Pendolinos trains and two overnight (sleeping) trains leaving from Prague’s main railway station bound for Vienna Südbahnhof railway station. You can either buy tickets online or at major stations from the international counter. If you do not have time you can also purchase tickets from the conductor once you board the train (but you will be charged a hefty supplement). If you wish to purchase tickets online be warned that some international websites selling tickets do charge an extra booking fee and you might end up paying up to twice as much compared to if you buy the tickets directly from the Czech Railways website. An e-ticket from Prague to Vienna purchased from the Czech Railways website, booked at least three days in advance, can cost as little as 19 EUR (limited availability). 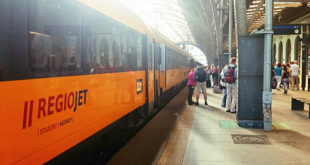 Eurocity trains connect Prague to Berlin, Vienna and Budapest. It is a very comfortable way of travel, but not as quick as in other countries – Eurocity has average speed about 120 km/h as the Czech railroad network is not suitable for higher speeds. Super City Pendolino trains operate between Vienna and Prague (station Praha – Hlavní Nádraží). Reservation is necessary on these trains. If you come to Prague by SC Pendolino, you can use Airport Express to Prague Airport without any additional fee. These buses operate every 30 minutes (5:15AM to 9:45PM). Without a SC Pendolino ticket, you will have to pay 45 CZK to the driver. Alternative: Private transfer by taxi, minibus or bus.